M T D F e b r u a r y 2 0 1 9 10 N e w s / V i e w s Bites Magna Tyres expands Magna Tyres Group, based in the Neth- erlands, is opening an office in Canada to serve the North American market. Alex Vitale is general manager. He most recently was CEO in North America for Prometeon Tyre Group Commercial Solutions LLC, the commercial arm of Pirelli Tire North America Inc. USTMA issues report The U.S. Tire Manufacturers Association (USTMA) has issued a sustainability report, which presents its membership's collective progress and shared vision for a sustain- able U.S. tire manufacturing industry. Ford promotes Quick Lane Quick Lane Tire & Auto Center, a busi- ness of Ford Motor Co., has more than 800 locations in the U.S., and is focusing on consumer convenience in a new advertis- ing campaign. Alliance gains member The newest member of the Aftermarket Auto Parts Alliance Inc. is Distribuidora De Autopartes Pescador, S.A. (DAPESA). Founded in 1995 and headquartered in San Rafael, Mexico, DAPESA is operated by brothers Daniel and Domingo Pescador and serves a majority of Mexico from four warehouses. Seanard joins Renault Groupe Michelin's CEO Jean-Dominque Senard is the new chairman of Renault Group. Renault's board of directors tapped Senard following the resignation of Chair- man and CEO Carlos Ghosn. Senard had previously announced his intention to leave Michelin at the end of the 2019 sharehold- ers meeting. BKT helps community Balkrishna Industries Ltd. (BKT) had a major role in the creation and construction of a community kitchen in Bhuj, India. The kitchen serves food to local school chil- dren, helping to fight hunger and malnutri- tion. BKT has a tire plant in Bhuj. Denso adds classes Denso Products and Services Americas Inc. has added four training classes to its instructor-led automotive repair courses and now offers 45 classes through the Denso Automotive Technical Academy. K&M Tire thrives in a year of disruption for tire distribution W ith 730 employees working from 28 warehouses to provide tires to customers in 27 states, K&M Tire Inc. recorded a fih straight year of double-digit growth in 2018. And with more tire brands available, more tires in inventory, and more people on its payroll, K&M expects that growth to continue into its 50th year in business. Cheryl Gossard, president of the company her father, Ken Langhals, started in 1970, says sales increased 14.5% in 2018. 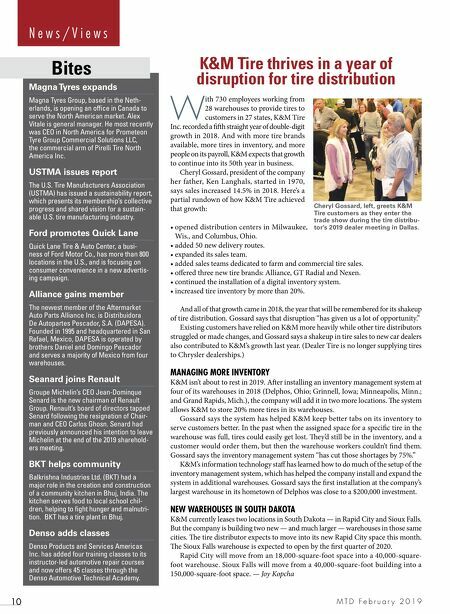 Here's a partial rundown of how K&M Tire achieved that growth: • opened distribution centers in Milwaukee, Wis., and Columbus, Ohio. • added 50 new delivery routes. • expanded its sales team. • added sales teams dedicated to farm and commercial tire sales. 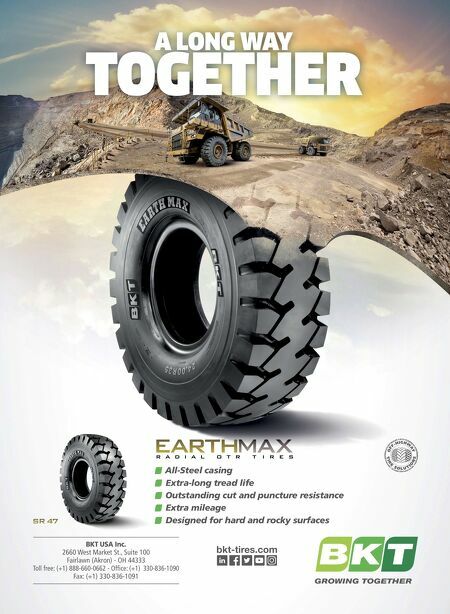 • offered three new tire brands: Alliance, GT Radial and Nexen. • continued the installation of a digital inventory system. • increased tire inventory by more than 20%. And all of that growth came in 2018, the year that will be remembered for its shakeup of tire distribution. Gossard says that disruption "has given us a lot of opportunity." Existing customers have relied on K&M more heavily while other tire distributors struggled or made changes, and Gossard says a shakeup in tire sales to new car dealers also contributed to K&M's growth last year. (Dealer Tire is no longer supplying tires to Chrysler dealerships.) MANAGING MORE INVENTORY K&M isn't about to rest in 2019. Aer installing an inventory management system at four of its warehouses in 2018 (Delphos, Ohio; Grinnell, Iowa; Minneapolis, Minn.; and Grand Rapids, Mich.), the company will add it in two more locations. e system allows K&M to store 20% more tires in its warehouses. Gossard says the system has helped K&M keep better tabs on its inventory to serve customers better. In the past when the assigned space for a specific tire in the warehouse was full, tires could easily get lost. ey'd still be in the inventory, and a customer would order them, but then the warehouse workers couldn't find them. Gossard says the inventory management system "has cut those shortages by 75%." K&M's information technology staff has learned how to do much of the setup of the inventory management system, which has helped the company install and expand the system in additional warehouses. Gossard says the first installation at the company's largest warehouse in its hometown of Delphos was close to a $200,000 investment. NEW WAREHOUSES IN SOUTH DAKOTA K&M currently leases two locations in South Dakota — in Rapid City and Sioux Falls. But the company is building two new — and much larger — warehouses in those same cities. e tire distributor expects to move into its new Rapid City space this month. e Sioux Falls warehouse is expected to open by the first quarter of 2020. Rapid City will move from an 18,000-square-foot space into a 40,000-square- foot warehouse. Sioux Falls will move from a 40,000-square-foot building into a 150,000-square-foot space. — Joy Kopcha Cheryl Gossard, left, greets K&M Tire customers as they enter the trade show during the tire distribu- tor's 2019 dealer meeting in Dallas.